summer as much as I am. Today I wanted to show you the project that I took along with me on my camping trip. 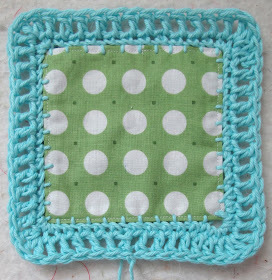 using 5" squares that are sewn together and then adding crochet. so when I saw the photo...I was inspired and started immediately! and it's a crochet along as well! Fabric/Crochet fused together = fun!!! 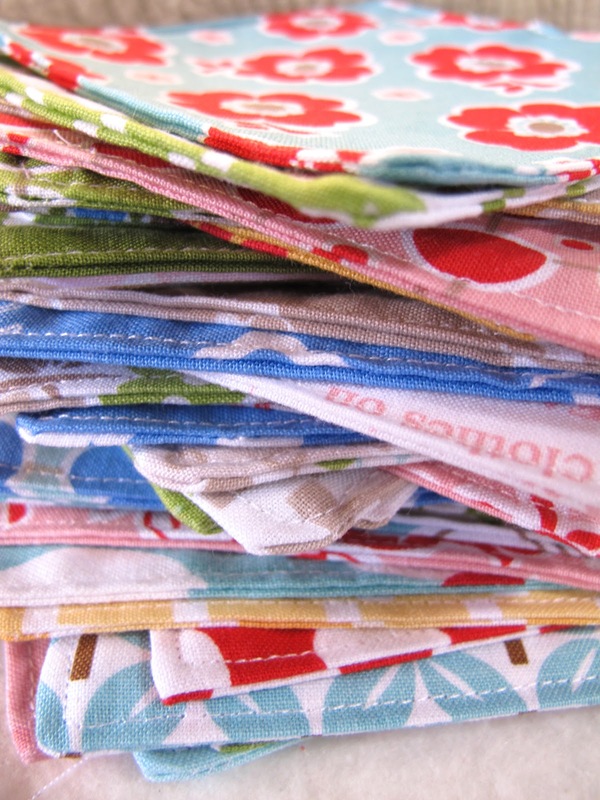 Sew Cherry, Daisy Cottage and Millie's Closet. 68 Aqua that I bought at Hobby Lobby. It's so soft and the color is yummy and goes with all of my fabrics...and is 100% cotton which is a big plus for me. they really work up fast. I did a single crochet into each buttonhole stitch and then a double crochet into each single crochet and that's all! how they will look when I crochet them together. I will just use a single crochet stitch when joining them and I think I will leave the holes in the intersections...I like how it adds a lacy kind of look. I don't have anything new to show you yet...but Jodi has some new blocks...so go over and see them! 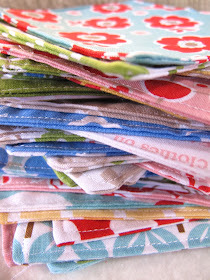 Next post...I will be showing you a sneak peek of my up coming fabric line. Oh, that's pretty cool! I've never seen a blanket like that before. I wish I knew how to crochet better. I saw the crochet along a while back. Your block are so pretty. Very very cute! Love this idea. I saw the original Crochet Fusion over a year ago on a blog, and she used Kaffe fabrics. I've wanted to make it ever since. I love yours in Aqua, and especially with your fabics! 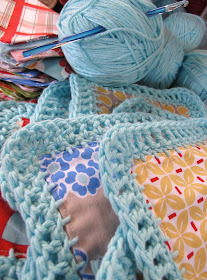 I have often wanted to add a crocheted edging to fabric, but can't figure out how to put the yarn thru the fabric. I'm assuming you poke holes somehow? How do you do this, and do it evenly, and how does the fabric not fray at the holes? 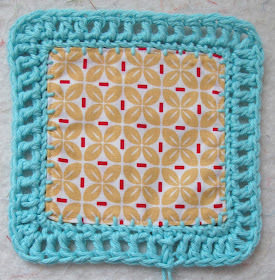 Is that one of your new fabrics I see in your pretty crocheted quilt? The red and white leaves on pink? 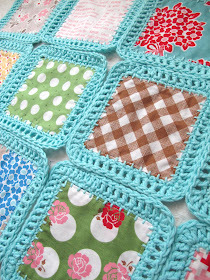 What a great idea, and your fabric squares are so lovely and cuddly :) Your great granny along was and is a lot of fun!! Wow! I'd love to get involved making one but sadly, I only have so much time to commit to crafting and I'm having so much fun making Great Granny Squares that I can't stop, lol. 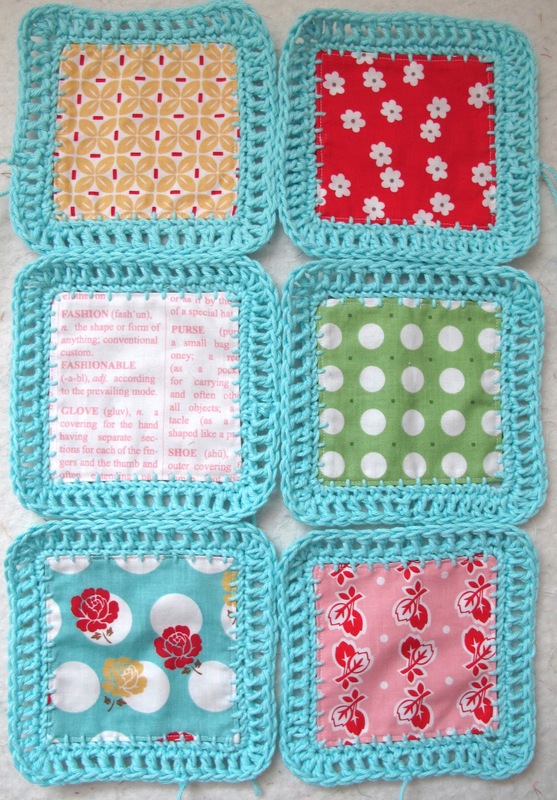 I've loved it so much that now I'm making 5" Great Granny squares. Wow! 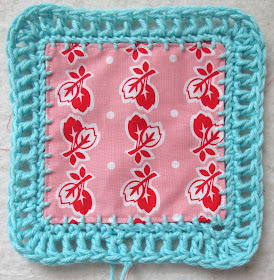 I'd love to get involved but, sadly I only have so much time to commit to all thing creative and I'm having so much fun making Great Granny Squares that I'm even making 5" squares too. Lol. Sorry about the duplicate comment. Blogger was giving me trouble and I didn't realize it worked. Ha. I have also crocheted around fleece strips and made baby blankets for Project Linus. They are fast and simple to make. 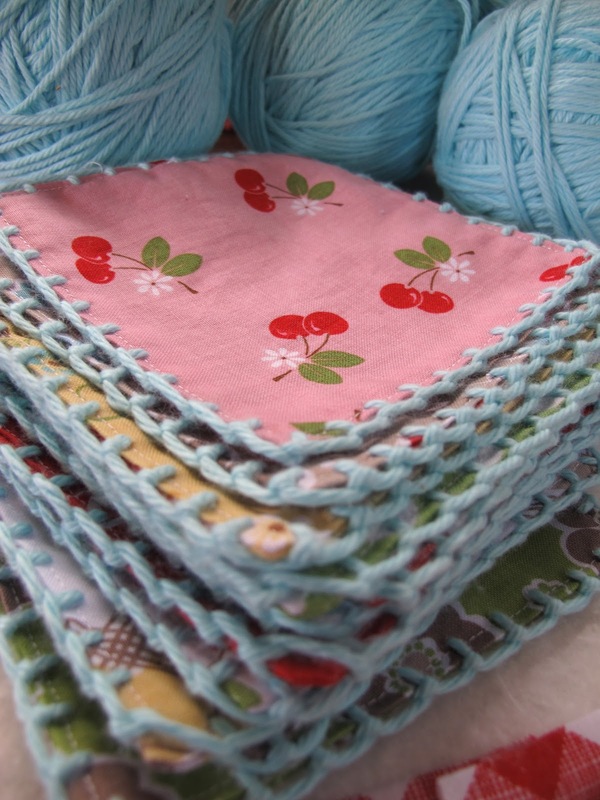 It is a great way to use up scraps and fleece can be single layers as it doesn't fray. I am so glad that I bought the blade that makes the holes. Those look just beautiful. It's a great take along project. I love this project, and can't wait to get started on it!!!! Hey Lori, that looks great! I love the idea of combining fabric and crochet like that! The aqua yarn is perfect too. This will be a fabulous blanket! I am already in love with your new fabric line. I can't wait to see it up close and personal though. I started crocheting again as well maybe I should venture outside of my granny squares and try this. Just a reminder... You are AWESOME!!! Super cute. I saw one of these on a blog. Now you're making one! Love it. Espec. with your fabric. Wow! That is a great idea! 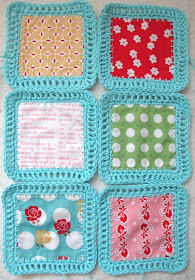 And the aqua cotton crochet around each square is soooo cute... so vintage. Thank you for sharing!!! 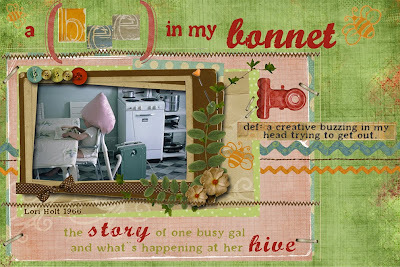 I am dying to get started on my Great Granny - love all the fun ideas you share! Thank you! That is such a great idea. I would also like to know how you got the yarn threw the fabric. What did you use to poke the holes? Well this is a timely idea! Love it...my daughter and I have been learning how to crochet this summer and really enjoying it. I also quilt and have an obsession with collecting charm packs in my favorite fabric lines....can't wait to get started ;). Thank you! That is so pretty (so you) and so clever! I absolutely love your version. I particularly like the way you did your crochet. 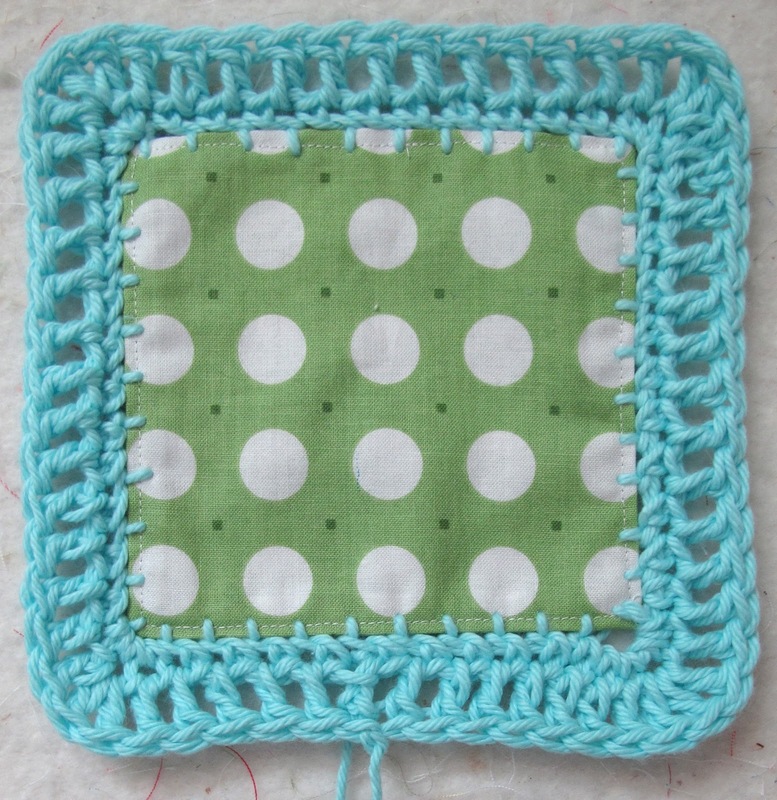 I don't know a whole lot about crochet yet, but can you tell me what stitches you used - yours looks different from the tutorial from LMS. Thanks! That is something different. I like it. Can't wait to see how it all turns out once you get it all together. I'm doing one similar to this as well. ooo, I'd love to try this, but maybe I'd quilt the squares as well so it would be super warm as well as lovely to look at! the ideas just keep coming! Those are pretty. A friend of mine is going to show me how to crochett on the edges of some of my blankets one day. 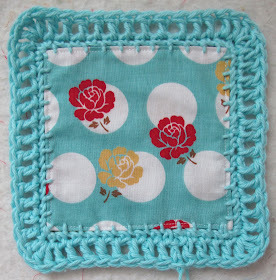 Did you start with a blanket embroidery stitch and add the crochet to it? 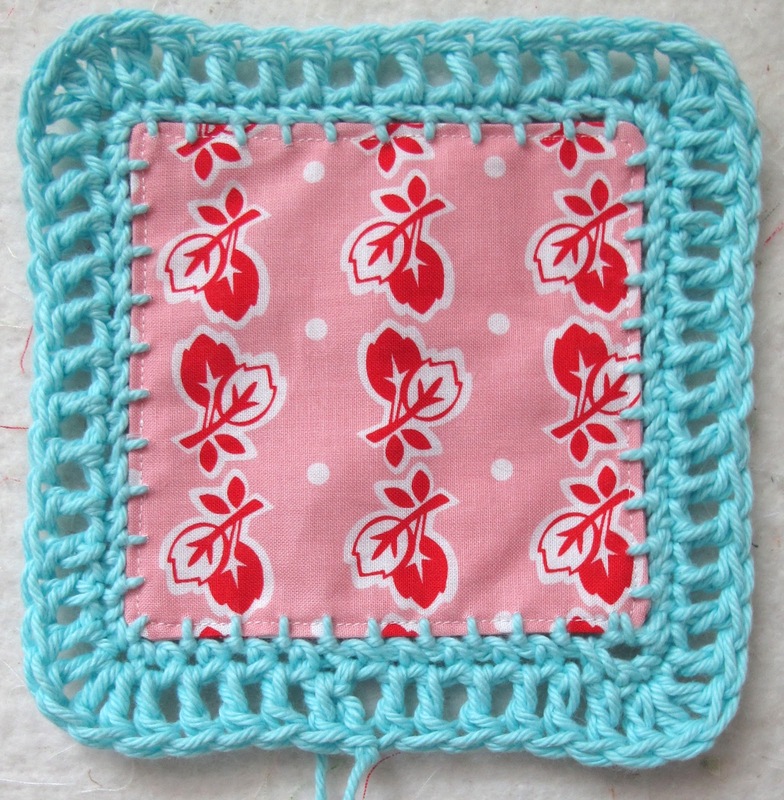 Did you embroider a blanket stitch edge, then add the crochet? What kind of needle did you use and did you use the same yarn that you used to crochet to do the blanket stitch? So cute! I wish I knew how to crochet! 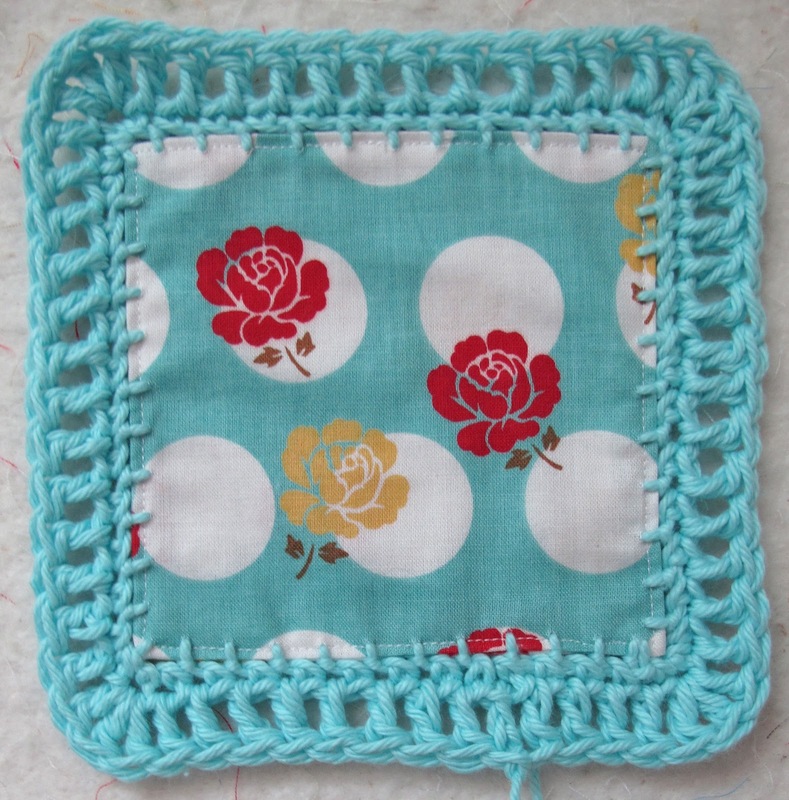 What crochet stitch(es) did you use? I have several old blue jeans, do you think I could do this? I need to do something with before my husband pitches them out. I love this! I really think I could do this. You always inspire me! Just saw your version of my Fusion Blanket Design (Kaffe Fusion Blanket), and it's stunning! I love your colour choices, it really pops. 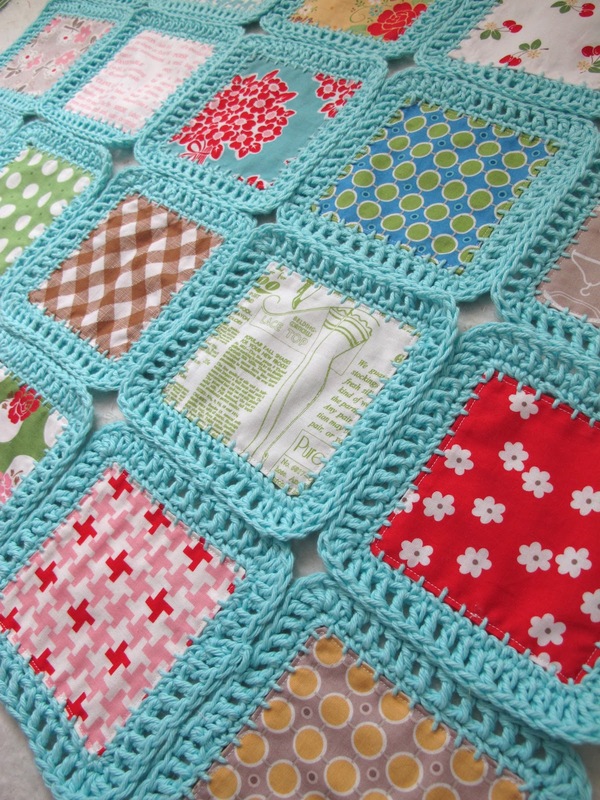 Your project photo just got shared on Facebook, and I wanted to pop in to tell you how much I love that you chose to edge the fabric squares in aqua instead of a neutral white, cream or black. I love the pop of color and the way it coordinates/contrasts with the fabric it surrounds. Great project, and I'll peruse your blog to see if it is finished! 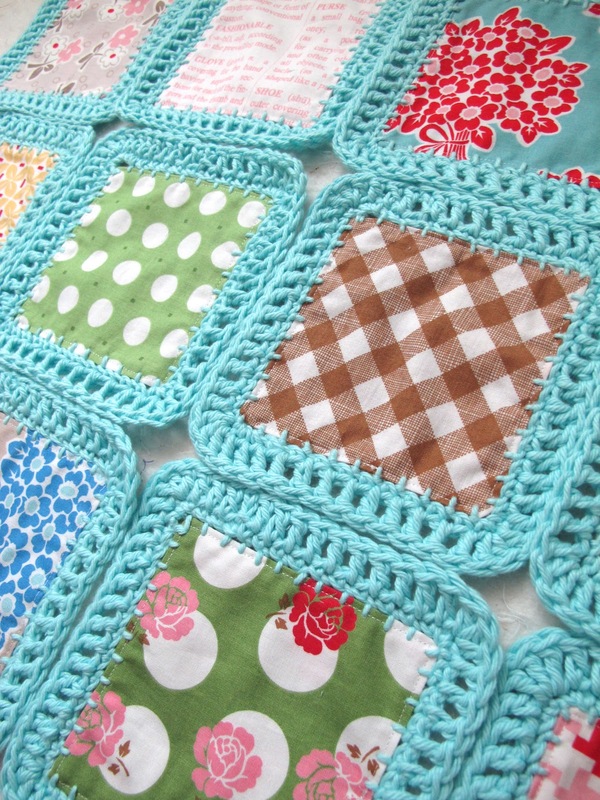 How did you make the holes in the fabric to crochet in? I love this I have not crochet in years but I need to get back to it. My husband has lung cancer and I have spent many a day in a hospital room with nothing to do but be with him while he sleeps this would be something I could take with me and work on. Thanks for sharing. Just found & pinned this and can't wait to get started on making one. 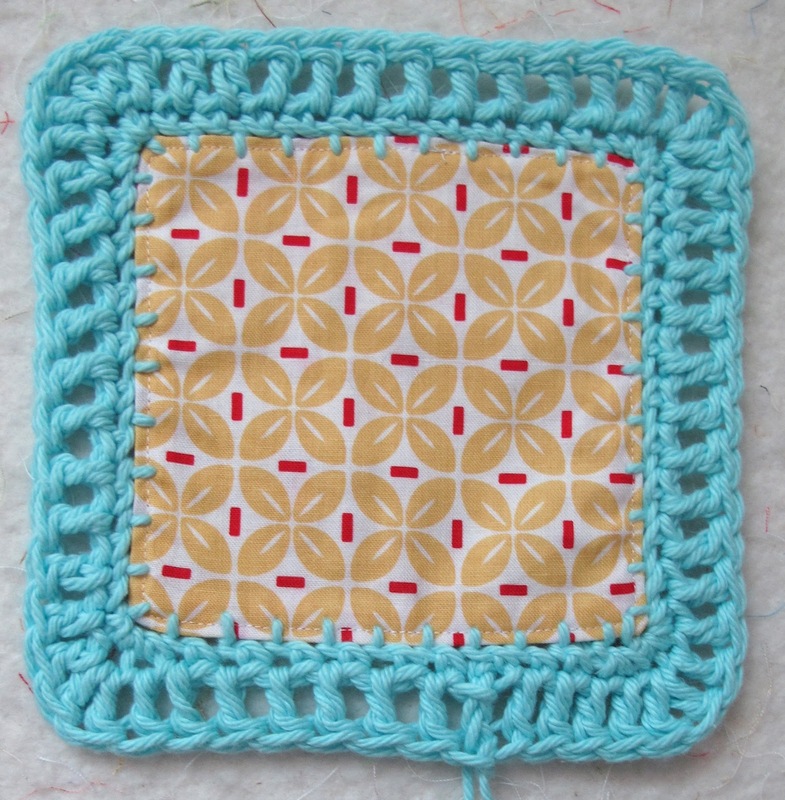 I think I would use the Flat Braid Join to join the squares together. Thanks so much! It looks so fun! Did you finish this? Is there a picture of it if you did?